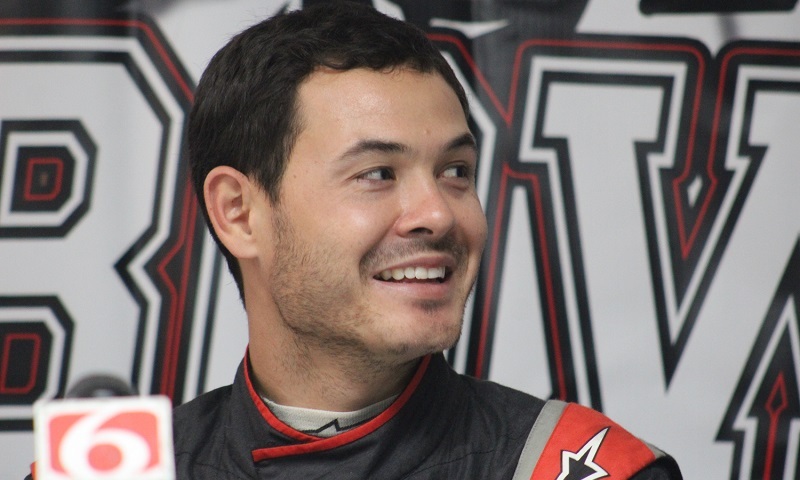 TULSA, Okla. – Kyle Larson didn’t miss the fact that he was the only driver at Monday’s pre-Chili Bowl press conference not to have won a Golden Driller. And considering he was seated between defending champion Christopher Bell and two-time winner Tony Stewart, with Rico Abreu to his far right, it’s easy to see why. None of them let him forget it throughout the half-hour session, nor did event co-founder and promoter Emmett Hahn. Stewart jokingly held Larson back as Larson faked a move to get up from his chair and jump over the table when asked about his lack of a Saturday night championship A-Feature victory. As laughter erupted from around the room, Larson cracked a smile before responding in seriousness. “Trust me, I recognized as soon as I sat down that I was the only one that hadn’t won this deal,” he said. “I think it’s mostly, probably, me overdriving … and then a little bit of bad luck as well. Last year, the flagman kinda got me in the C-Main … hopefully they’ve fixed that this year!” he directed at Hahn. – To his credit, Stewart showcased plenty of emotion as well during Monday’s presser, grinning from ear to ear after already having put in work on the quarter-mile track prior to practice kicking off. As he starts his third year working the tractor and helping to keep Tulsa Expo Raceway in tip-top shape, Stewart reflected on how special both the venue and his latest gig during Chili Bowl week are to him. It’s a personal sense of accomplishment for Stewart, as a matter of fact. – As of the start of Monday’s practice session, the final count for entries was a grand total of 357, down ever so slightly from last year’s event record of 365. Among this year’s field are drivers hailing from 39 U.S. states, as well as Australia, New Zealand, Canada and the United Kingdom.